The ramping up of the NFL offseason means lots of questions worth answering out there about the Seahawks. So let’s get to it. Q: @ianrolfe asked: Assuming (Frank) Clark is not tagged, could Hawks tag and then trade Earl (Thomas) instead of losing him to FA (free agency)? A: Theoretically yes, practically no. I wrote about this last month, as well, but at that time neglected to mention one key fact — tagged players don’t have to sign the franchise tag. That was something former NFL agent Joel Corry, who now writes about salary cap issues for CBSSports.com, reminded me when I asked him about this scenario this week. As Corry noted, unsigned players can’t be traded. Seattle could tag Thomas with the hope of trading him. But if Thomas doesn’t sign the tag then he can’t be traded. Indeed, Thomas surely would not sign the tag immediately, and maybe never if he didn’t like where he might be headed. And as I wrote last month, Thomas likely wouldn’t fetch all that much in that scenario, anyway, with just one year on his contract and a new team needing to handle what to do about re-signing him (I also think the Seahawks may well need to use the tag on Clark, making this all moot anyway). Corry said the above scenario makes it not worth even bothering to think about trying to tag and trade Thomas before the free agency period begins March 13. “Just take the 2020 compensatory pick and move on,” he said. Q: @BertramDewell asked: When Earl leaves in free agency are there compensatory pick(s)? A: That’s the Seahawks’ hope. But this may be a good time to recall how that works. Teams are awarded comp picks based on a formula of net gains in free agency vs. net losses. Teams that lose more than they gain are awarded picks — up to 32 are awarded each year (and this is only for players who become unrestricted free agents when their contracts run out, such as Thomas, and not for players who are cut). So it’s not a strict one-for-one, as in losing Thomas means a third-round pick or something. Seattle last year saw some big-name free agents leave, such as Jimmy Graham and Paul Richardson. And the thought going into free agency was that the Seahawks would play the game of trying to accumulate a few comp picks, as they have often done in the John Schneider/Pete Carroll era. But Seattle signed Ed Dickson and Barkevious Mingo and that canceled out the players they lost, and the Seahawks ended up without any comp picks for the 2019 draft, one reason Seattle has just four at the moment. Seattle has roughly $52 million in cap space as of Friday, so the Seahawks would seem to have some room to make some signings this year if they want, though re-signing their own players may take up a lot of that (as well as precedence in what they want to do). So that may well equal getting a comp pick for Thomas. But it will take some time to sort that out. Q: @Weavingthrulife asked: Where will the Seahawks look for a new (accurate) kicker? A: The same places as always — the ranks of the rookies who are entering the league this year and veteran free agents. I mentioned some of the best candidates in each of those groups in my overview earlier this week of the special teams. As noted there, Seattle has already signed Sam Ficken, who played at Penn State and spent parts of the last two seasons with the Rams, for 2019. The Seahawks will almost certainly keep looking as they did last year when they signed Jason Myers shortly after the season and signed Sebastian Janikowski in April after he became available. 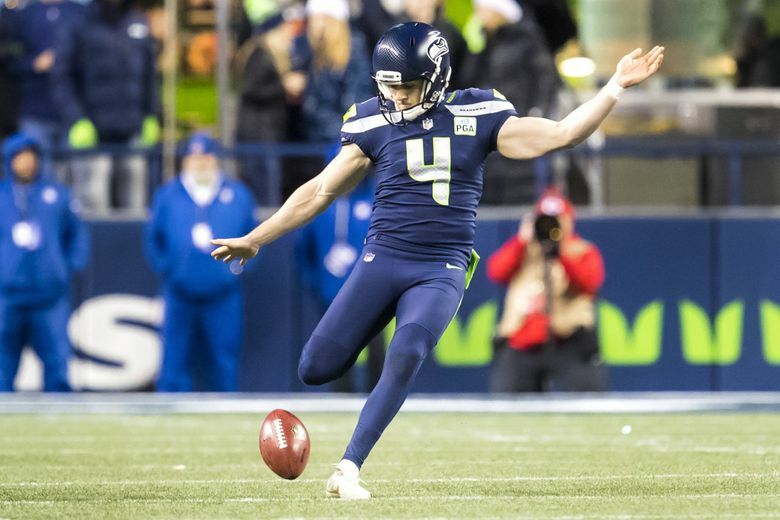 The Seahawks probably should have just kept the 27-year-old Myers, which shows how tricky this can all be even if it seems like it should be easy to find a reliable kicker. Myers hadn’t made better than 80 percent of his kicks in his two previous seasons with Jacksonville, which led to him getting released by the Jaguars and signed by Seattle, which released him again. Then he hit 33 of 36 with the Jets after they claimed him off waivers to earn the spot on the AFC Pro Bowl team. But I can’t imagine any Seahawks fan really thought the team was releasing a Pro Bowl kicker when they waived Myers halfway through the preseason. Just as I don’t think anyone really thought much of it in 2011 when the Seahawks signed Stephen Hauschka, who had been waived by five different teams before signing with the Seahawks, and suddenly seeing the light go on and turning into one of the best kickers in franchise history. Maybe Seattle should have just kept Hauschka. But he had missed a few key kicks down the stretch in 2016, and the Seahawks were trying to save a little money (Blair Walsh in 2017 was about $2.4 million cheaper than Hauschka was with Buffalo). Janikowski also wasn’t that bad. He hit 22 of 27 and three last-play game-winners. But his age (41 next season) and the injuries he had down the stretch point to the Seahawks continuing to look and hoping this time they strike it rich the way they did with Hauschka. Q: Bob Bryan @seabryan asked: What’s the plan to improve special teams? So many breakdowns last year; has the time passed for a coaching change? A: There’s no apparent coaching change coming — that likely would have happened by now and it hasn’t. Brian Schneider has been Seattle’s special teams coach since Carroll arrived in 2010 and overall the special teams have been more than fine. But as the questioner notes, the Seahawks did have a few breakdowns at the end of the season, notably the kickoff return for a TD against the 49ers, the blocked punt for a TD against the Cardinals and the long punt return against the Cowboys. Carroll mentioned that he thought one reason for some of the breakdowns was young players who had been primarily special teamers having to play more in other roles as the season went on. “Just a little negligent technique-wise,” he said the Monday after the Arizona game of what he thought the biggest issues had been. So the obvious solution is to improve the depth. Q: @EricHansman asked: Which former Seahawk is likely to return in free agency, Golden Tate, Jermaine Kearse, or James Carpenter? A: Of those three I think I’d say Carpenter. Tate is going to get a decent salary and likely more than Seattle is going to want to pay when it already is paying Lockett and Doug Baldwin quite a bit. And Carpenter may fill a bigger need than Kearse could of being able to play guard and do so in the kind of style that Mike Solari preaches and teaches. Q: @shhhmoney12 asked: Bob, are the Seahawks gonna sign Le’Veon Bell? Are they gonna tag Clark and then trade him for AB?